By allowing a Frankenstein support representative to provide Remote Assistance, you accept responsibility for any changes made to the desktop content or system settings. Frankenstein does not assume and is not responsible for any liability for the linking and viewing of any desktop content. 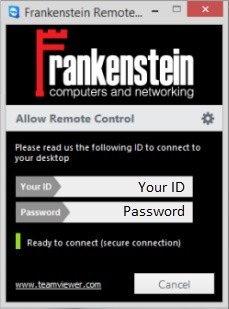 As such, Frankenstein recommends you remain at your desktop and observe the entirety of the remote session. You will retain control for the duration of the remote session and can terminate the remote session at anytime. Once you are on the phone with a member of our support team, you will be directed back to this page, and click on the TeamViewer image to go to the TeamViewer download page. Depending on what browser you use, you will be prompted Run or simply click on the downloaded file (TeamViewerQS executable). You will be asked if you want to allow the file to run by Windows. A window that looks just like the TeamViewer image will appear. Please read the ID and Password to the support representative. Click the image below to proceed. Please note that charges will apply to remote sessions. The cost of this service is $85/hr and is charged in 15 minute increments.